If there’s one thing we’ve learned, it’s that when we’re in Montréal, we crawl. After our last Montréal en Lumière event finished, we got busy planning a route that would bring us to as many recommended spots as possible. On our last trip, we completed our beloved croissant crawl, but decided we wouldn’t limit ourselves just to pastries this time. This year, we expanded our itinerary to include several more indulgences, also brought to you by the letter "P." Specifically, it grew into a pastry-pastry-park-pastry-pub-poutine-pub crawl. Before you judge us, remember there were three of us, we walked about eight km, and it took nine hours—so it wasn’t crazy extravagant. I like to believe we invented a new team sport that day. With our route established, we set out after a very story-worthy lunch at Wilensky’s. Our first stops brought us back to two favourite bakeries from our last visit to Montréal: Pâtisserie au Kouign Amann for me, and Mamie Clafoutis for Lindsay. In addition to the caramelized, buttery pastry wedge that is kouign amann, we also had this gorgeous blueberry-almond tart at the first pâtisserie. We ate them in a beautiful sunlit nook while drinking café au lait. At Mamie Clafoutis, it’s the heavy-handed portion of chocolate ganache in the "Oh Mon Dieu" that makes this pastry (and this pâtisserie) so memorable. We also got a cranberry and pistachio square, which was wonderfully tart and sweet. We ate these while overlooking the pastry chefs hard at work in their massive kitchen. From there, we took a break from eating and explored Parc La Fontaine, which was conveniently located en route to the next bakery. Here we discovered yet another sprawling outdoor ice rink, and stopped to show off our ice-sliding skills. Outdoor ice rinks are something Vancouver winters just cannot deliver, and I’ve dearly missed them since moving west. Growing up in a hockey-obsessed family meant that I even had one in my own backyard for a few seasons. and arrived at La Fabrique Arhoma. There, we decided to try a savoury cheese pastry and a lime curd and white chocolate square. We also recharged with kombucha—we take such good care of our guts, don’t we? We walked a few minutes down the street to Station Ho.st, a warm, wooded pub that is the Montréal outlet for all Hopfenstark craft beers (brewed in the Lanaudière region). Lindsay sipped the Kamarad Friedrich Russian Imperial Stout (11%! ), Ariel ordered the Postcolonial IPA (6.5%), and I got the Saison Station 55 (6.5%). And while it may not be smart to precede a meal of gravy, cheese, and fries with a different version of deep-fried potatoes, that is exactly what we did: we sipped our beers alongside a big basket of the unmatched Covered Bridge dill pickle chips (New Brunswick represent!). Next, we walked down the street to Poutineville, a Montréal institution when it comes to curd-covered fries. 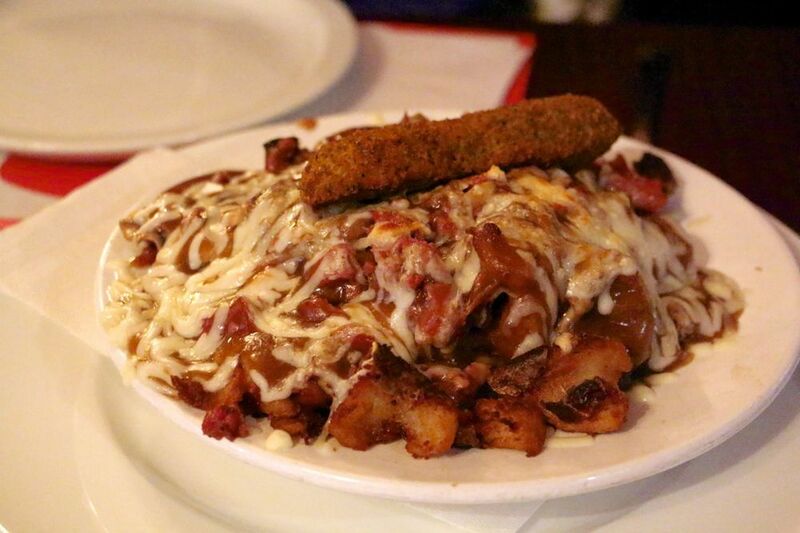 We ordered both a classic poutine and ‘The Montréaler,’ which was topped with smoked meat, Swiss cheese, mushrooms, and a deep-fried pickle. Poutine is the perfect way to warm up from a day walking through icy winds. Look at how happy it made us. I want to eat poutine every day. We left Poutineville and walked down the street to our seventh and final stop: Le Cheval Blanc, a family-run tavern started in 1940. 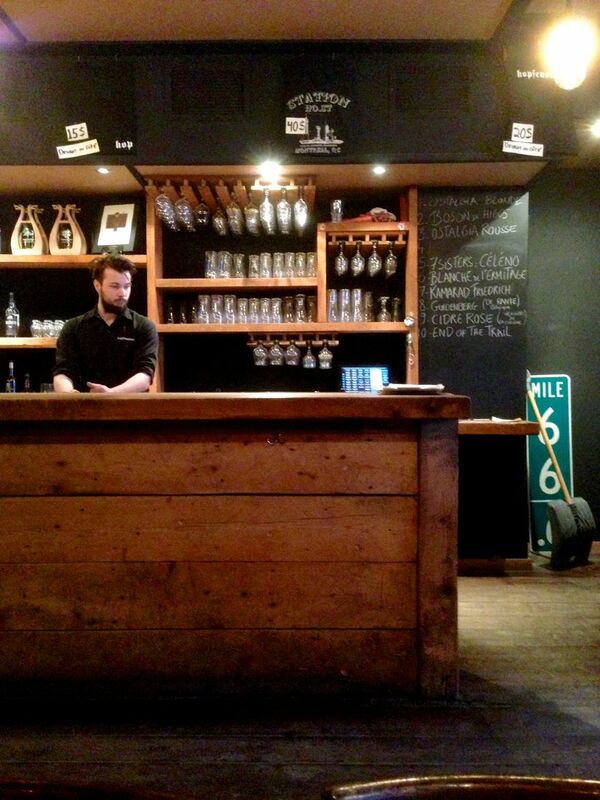 Over 40 years later, in 1986, it became Montréal's first craft brewery. Walking through the doors felt a little like we were walking into a dimly lit version of ‘The Max’ from Saved By the Bell. They have nine brews on offer, and we tried the APA (5.5%), the MiMi IPA (5%), and the Blanche (5%). It was here that our epic day finally began to take its toll: our eyelids started to droop, and our comfy beds started calling our names. Nine hours and seven stops later, we finally called it a day and boarded the Beaudry subway. Once home, we hit the pillow hard, as all serious athletes do. Our advice to you, whether you live in Montréal or plan on visiting it: CRAWLING IS FUN, so find some friends, pick a neighbourhood, choose a ridiculously long hashtag (#pastryparkpubpoutinecrawl), and crawl, crawl, crawl.